Retail displays and Point-of-Sale units are an important aspect to your business and can serve a variety of purposes. Drawing customers into your shop, contributing towards a positive experience, promoting products & promotions are all reasons why businesses should be investing in these products. Some display units are made from cardboard, however we manufacture from plastic. Plastic over cardboard provides a series of benefits including durability, a high quality finish plus the units can be wiped clean, allowing for a clean & tidy retail space. Our signs department is also able to cater for retail needs including shop fascias, A-boards, vinyls, banners & more. Hampshire Signs & Plastics have the ability to turn your exhibition designs into an exciting reality. 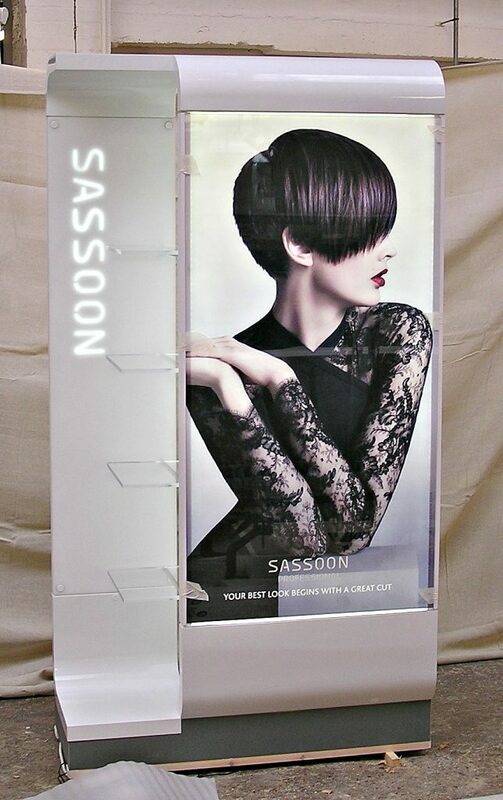 Our skilled employees are able to create anything from basic leaflet holders, right up to large stands & bespoke displays. Hampshire Signs & Plastics will manufacture retail units, displays, exhibitions bespoke to the individual needs & requirements of the customer. A range of fabrication techniques can be employed and combined to acheive the desired finish including CNC profiling, forming, moulding, bending, polishing & gluing. The final products can be manufactured from a variety of materials, details of which can be found here.